The FirstStudio® LitePanel Kit is an effective and economical reflector lighting solution that is easy to use and easy to transport. Ideal for indoor/studio sets, the panel can be positioned up to 7 feet high, allowing for maximum diffused coverage over your subject(s), working like a SoftBox to reduce the harsh contrast of your studio lights. The collapsible, shock-corded PVC frame is quick assemble, and then disassembles into its own carry bag. With optional, easy-to-attach additional reflector panels (available separately) in gold, silver, white reflective, black and matte white surfaces, it gives you the ability to produce various effects on your subject. High Quality Fabrics This kit features our translucent & white/ soft gold fabrics. Our reflective fabrics are double-laminated and reversible for maximum coverage and minimal light loss. 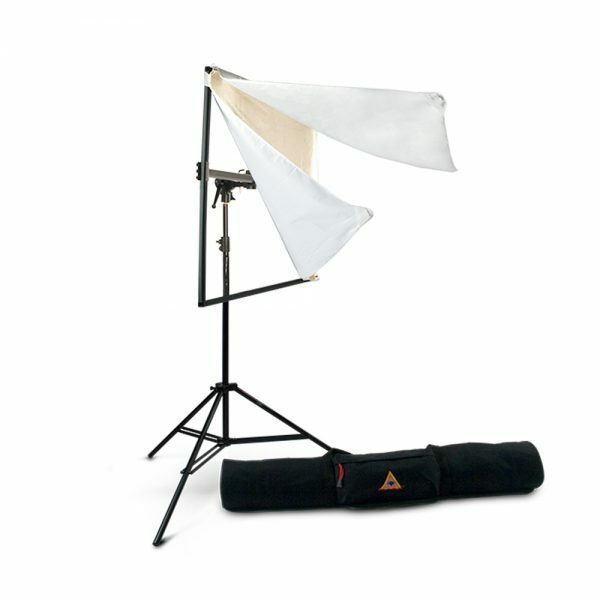 Interchangeable Fabrics Each Photoflex® LitePanel Fabric is attached with stretch-tight elastic corners. This allows air to flow around the fabrics on breezy location shoots, and means the fabrics can be reversed or changed out in seconds. Three reversible reflective fabrics are available separately. Sturdy Frames Designed with a shock-corded frame so they can be set up and torn down in minutes, our specially designed tubing is easy to grip while moving and adjusting the panel, and allows various third party attachments or clamps at almost any angle. The aluminum, square tube frame prevents twisting while the rounded edges make it easy to position two panels together. LitePanel Hardware Our LitePanel Hardware allows you to place a LitePanel wherever you wish with added security and functionality to the LitePanel. A unique modular design facilitates a variety of clamping options giving you unlimited freedom to reproduce your vision. Ideally suited to work with the new Photoflex LiteReach Plus hand held extension boom, so your assistant can quickly and ergonomically position a LitePanel wherever it is needed; although the hardware will mount to suitable Photoflex LiteStands.